Pat Brown, left, and William Vardaman, mechanical technicians with the Jacobs contracting team, perform engine maintenance on NASA’s crawler-transporter 2 on March 26, 2019. 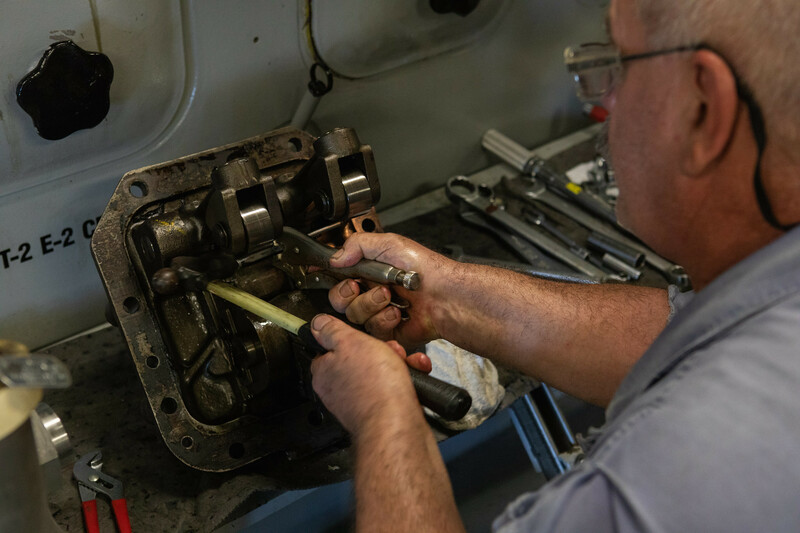 Even the toughest vehicles need regular maintenance to function at their best. Recently, William Vardaman and Pat Brown, both working under the Jacobs contracting team, performed engine maintenance on NASA’s crawler-transporter 2 in the crawler yard located in the agency’s Kennedy Space Center’s Launch Complex 39 area in Florida. The massive, tracked vehicles are powered by large electrical power engines and two 16-cylinder American Locomotive Company (ALCO) engines. 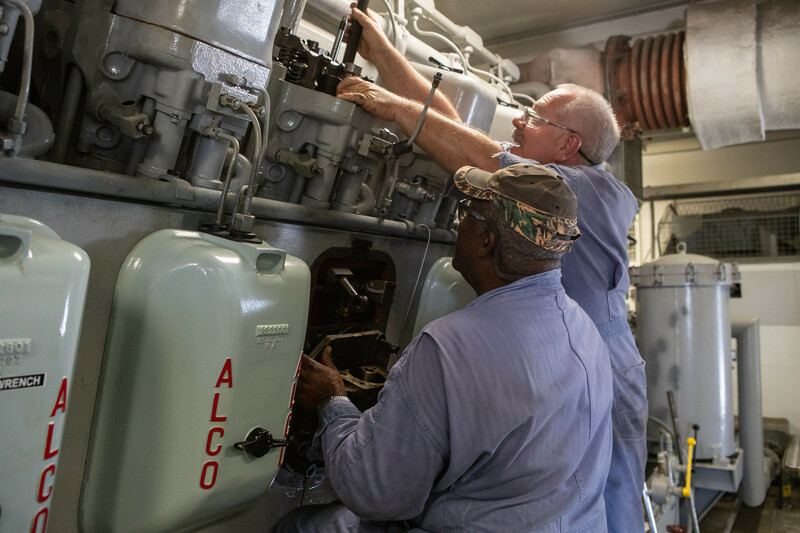 Vardaman and Brown, both mechanical technicians supporting the agency’s Test and Operations Support Contract, spent several days rebuilding the vehicle’s fuel pump assemblies on both ALCO engines. They also installed new oil pumps that will lubricate the ALCOs from the top down before they’re started, minimizing future wear. This is one of two crawler-transporters that carried rockets and spacecraft, including the Apollo/Saturn V and space shuttle, from the Vehicle Assembly Building (VAB) to the launch pad. Now, they’re getting ready for NASA’s accelerated return to the Moon. Crawler-transporter 2 has been modified and upgraded to carry the mobile launcher and NASA’s Space Launch System rocket, topped by the Orion spacecraft, for Exploration Mission-1, which will launch in 2020. The agency’s Exploration Ground Systems oversaw extensive upgrades to crawler-transporter 2, including new generators, gear assemblies, roller bearings and brakes, as well as the hydraulic jacking, equalization and leveling (JEL) cylinders that keep its carrying surface level. Last fall, crawler-transporter 2 carried the newly completed mobile launcher from its construction site north of the VAB, out to Launch Pad 39B, then into the VAB, where the mobile launcher continues extensive testing. The crawler is gearing up for another move of the mobile launcher back to the pad later this spring for more testing. The two of three motors for Orion’s Launch Abort System (LAS) are shown inside the Launch Abort System Facility, or LASF, at NASA’s Kennedy Space Center. Designed and built by NASA and Lockheed Martin, the jettison motor is on the left with the abort motor on the right. 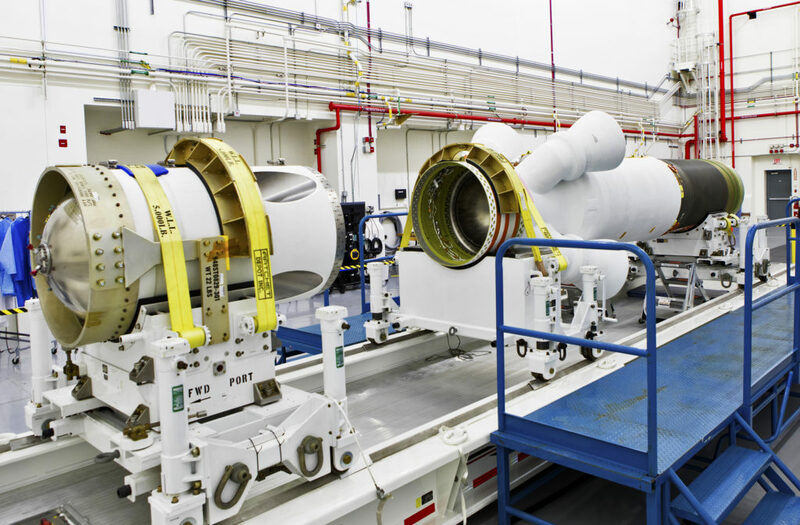 The motors arrived on Sept. 10, 2018, and are being stored in the LASF during processing for a full-stress test of the LAS called Ascent Abort-2. Launch Abort System, or LAS, motors are being assembled and checked out at NASA’s Kennedy Space Center in Florida for an upcoming test for the Orion spacecraft designed to send astronauts on trips to the Moon, and support human exploration to Mars. Orion is designed to launch atop the agency’s Space Launch System (SLS) rocket that will take astronauts into deep space. Before flying astronauts, the Ascent Abort-2 (AA-2) flight test will help verify that the LAS can pull astronauts to safety in the event of a problem during launch. The crew escape system will be attached to the top of the spacecraft. This illustration depicts the Ascent Abort-2 Flight Test scheduled for April 2019. An integral part of ensuring safe spaceflight, Orion’s Launch Abort System, or LAS, is a state-of-the-art crew escape system is attached to the top of the spacecraft. It can propel the crew module away from the rocket in milliseconds should a life-threatening event arise during launch. According to Carlos Garcia of Orion Production Operations at Kennedy there are three motors on the LAS- the abort, attitude control and jettison motors. The abort motor can propel the crew module away from the rocket in milliseconds should there be an issue with SLS on the pad or during launch. The attitude control motor would steer the spacecraft during the maneuver. The jettison motor will pull the LAS away from the crew module, allowing Orion’s parachutes to deploy with the spacecraft safely landing in the ocean. The abort and jettison motors for the test arrived on Aug. 27 and Sept. 10, 2018 respectively, and the attitude control motor was delivered Dec. 15. All are being checked out and processed in the Launch Abort System Facility, or LASF, prior to final assembly. On Aug. 3, 2018, in High Bay 4 of the Vehicle Assembly Building at NASA’s Kennedy Space Center, technicians with Jacobs check the alignment during stacking of the aeroshells for Orion’s Launch Abort System (LAS) rocket. 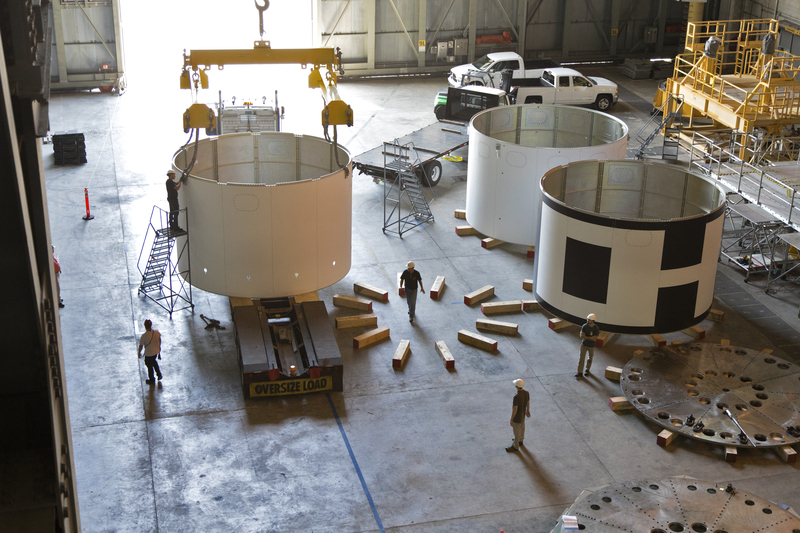 The aeroshells are being prepared for a full-stress test of the LAS, called Ascent Abort-2 Flight Test, or AA-2. 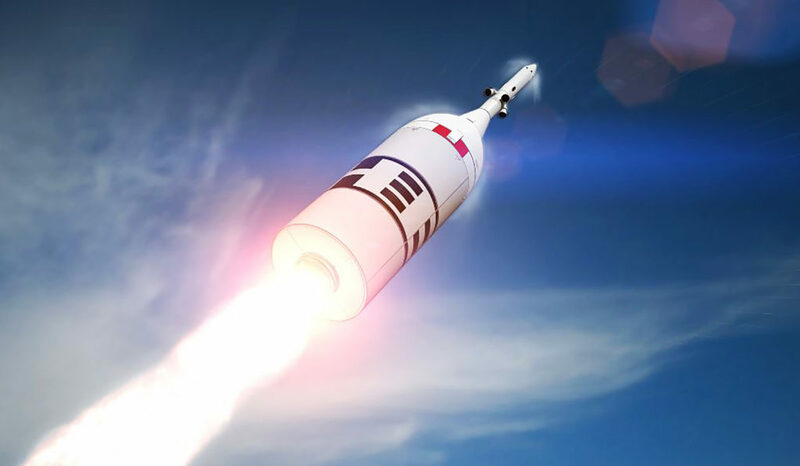 For AA-2, a test version of Orion equipped with 284 sensors will launch atop a booster provided by Northrop Grumman from Space Launch Complex (SLC) 46 at Cape Canaveral Air Force Station. The test booster is being processed in the space center’s Vehicle Assembly Building and later will be transported to SLC 46. “After the LAS is mated to Orion, the combination will be moved to the Cape for mating to the booster,” Garcia said. Targeted for May 2019, AA-2 will test an LAS abort under the highest aerodynamic loads it would experience in flight. The booster will accelerate to 31,000 feet, traveling at more than 1,000 miles an hour. The LAS abort motor then will ignite, pulling the crew module away from the booster. The jettison motor separates the LAS from the crew module. The AA-2 test will conclude as data recorders are jettisoned for retrieval in the Atlantic Ocean. NASA’s Recovery Team from Kennedy Space Center just finished a week at sea, testing and improving their processes and ground support hardware to recover astronauts in the Orion capsule once they splash down in the Pacific Ocean. 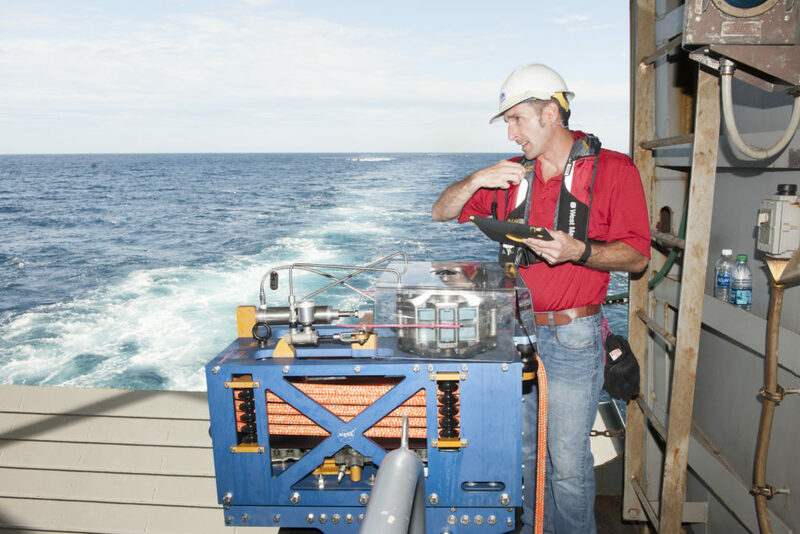 Aboard the USS Anchorage, NASA and the U.S. Navy worked together to run through different sea conditions, time of day and equipment scenarios—putting hardware and the people through their paces. Astronaut Stephen Bowen was aboard as an observer to better understand the recovery procedures and to offer an astronaut’s perspective. As a former Navy captain, Bowen has a wealth of knowledge to impart to the team—helping them better understand what the crew will be going through as they are bobbing up and down in the capsule after spending time in microgravity. “I understand what it’s like to be on a boat that doesn’t have a keel (a structural beam that runs in the middle from bow to stern to give it stability) in the open ocean,” Bowen said. “It’s not necessarily the friendliest of places to be.” And add that to the physical manifestations of re-entering a gravity environment after several weeks, Bowen’s first-hand knowledge will be paramount for the team as they hone their plans to make recovery smooth. The team still has several tests scheduled between now and Orion’s first uncrewed flight atop the new Space Launch System rocket, known as Exploration Mission-1. The mission will pave the way for future crewed missions and enable future missions to the Moon, Mars and beyond. During the flight, Orion will travel thousands of miles beyond the Moon before splashing down into the Pacific, where NASA’s Recovery Team will be ready and waiting for her. When astronauts depart for missions to deep space, they will cross the Crew Access Arm about 300 feet above the ground to board their spacecraft. 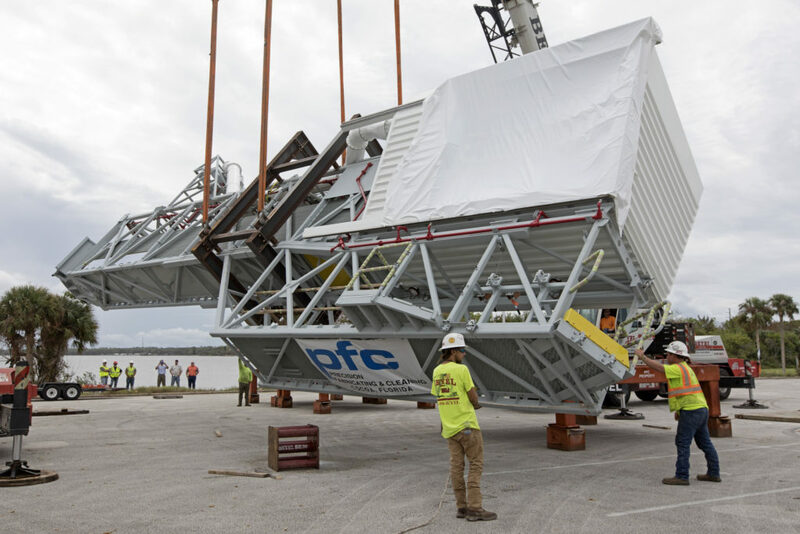 The access arm was delivered to NASA’s Kennedy Space Center in Florida on Oct. 17, 2017, to install on the mobile launcher in preparation for the first flight of the Space Launch System rocket, or SLS, and the Orion spacecraft. The SLS will be the largest rocket in the world and will be stacked with Orion inside the historic Vehicle Assembly Building, or VAB, on the mobile launcher and rolled out to the pad prior to launch. 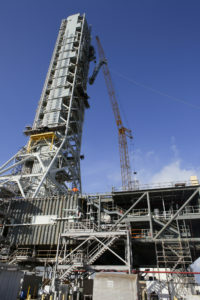 The access arm will be one of 11 connection points to the rocket and spacecraft from the tower on the mobile launcher. 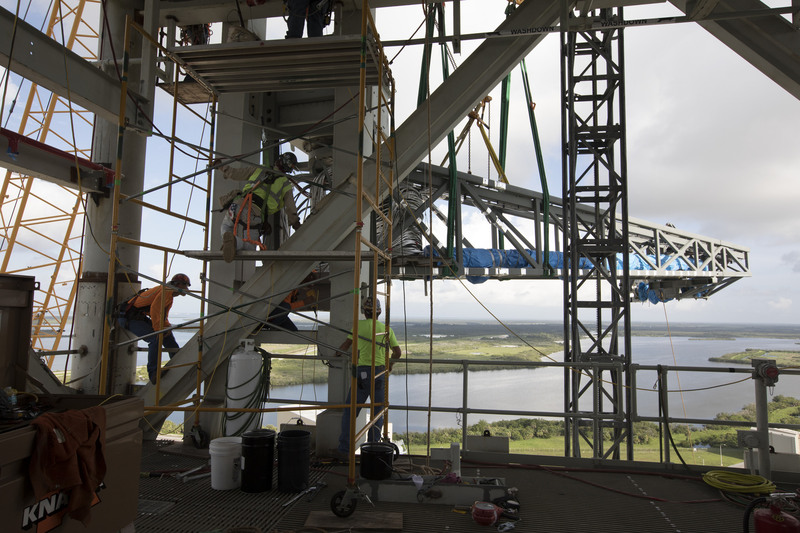 After technicians install the arm, the mobile launcher will be rolled into the VAB for validation and verification tests. For the first launch without crew, the access arm will provide a bridge to Orion for personnel and equipment entering the spacecraft during processing and prelaunch integrated testing while in the VAB and at the launch site. The arm is made up of two major components: the truss assembly and the environmental enclosure, or the white room. The arm will provide entry and emergency egress for astronauts and technicians into the Orion spacecraft. On future human missions, astronauts outfitted with newly designed space suits will enter the white room, where they will be assisted by technicians into the spacecraft for launch. The arm will retract before launch, and the other connections will release at liftoff, allowing the rocket and spacecraft to safely clear the launch pad. Just north of the Vehicle Assembly Building at NASA’s Kennedy Space Center in Florida, technicians install the core stage forward skirt umbilical on the mobile launcher. The Core Stage Forward Skirt Umbilical (CSFSU) recently was installed on the tower of the mobile launcher at NASA’s Kennedy Space Center in Florida, to prepare for the first launch of the agency’s Space Launch System (SLS) rocket with the Orion spacecraft atop. The mobile launcher tower will be equipped with a number of lines, called umbilicals, which will connect to the SLS and Orion spacecraft and provide commodities during processing and preparation for launch of Exploration Mission-1. Cranes and rigging were used to lift the CSFSU and install it at about the 220-foot-level on the tower. The CSFSU will swing into position to provide connections to the core stage forward skirt of the SLS rocket, and then swing away before launch. Its main purpose is to provide conditioned air and gaseous nitrogen to the SLS core stage forward skirt cavity. The Ground Systems Development and Operations Program is overseeing installation of the umbilicals on the tower. What is a LLAMA? It’s a Line Load Attenuation Mechanism Assembly, designed by Jeremy Parr, a mechanical design engineer in the Engineering Directorate at NASA’s Kennedy Space Center in Florida. He designed the LLAMA to help U.S. Navy line handlers retrieve the Orion crew module after it splashes down in the Pacific Ocean. Parr is the lead design engineer for Orion Landing and Recovery, which is coordinated and led by the Ground Systems Development and Operations Program. Parr’s design recently earned him second place in the agency’s third Innovation Awards competition. “The LLAMA concept came to me after watching the sailors fighting to control the Orion test capsule during Underway Recovery Test 1 in open water in February 2014,” Parr said. The standard Navy line tending practice is to wrap their lines around the ship’s T-bits, or large solid columns with a crossbar that resemble the letter “t,” located near the stern, so that the sailors can control big loads with only a few people. This works for most operations they do since the hardware they handle is usually big and slower moving in the seas. 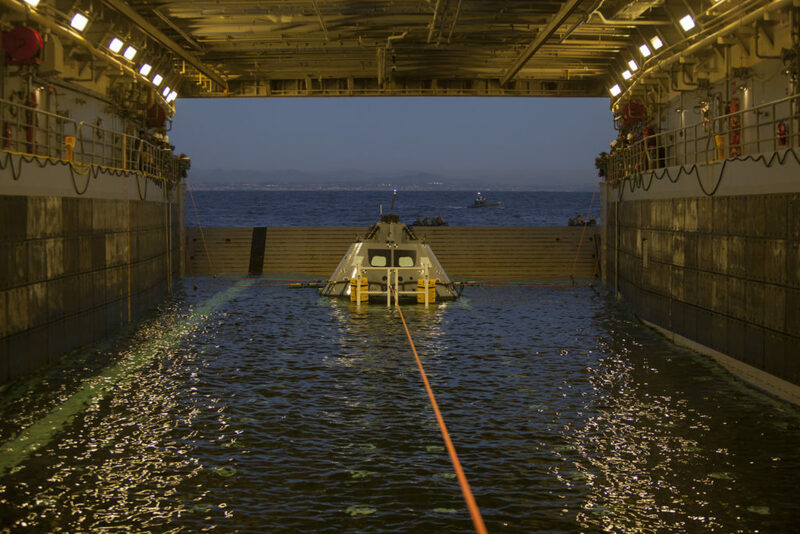 But the crew module is a different beast when floating in the water than anyone on the recovery team expected, Parr said. Orion is easily pushed around by wind and waves. The LLAMAs are mounted on the ship’s T-bits, and the mechanisms provide all tending line control of the crew module once it enters the well deck and until it is secured on the recovery cradle pads. The LLAMA-controlled tending lines are the baseline method for recovery of Orion after Exploration Mission-1 and all future missions. Parr began working at Kennedy in 2007. Prior to that, he worked for SAIC at Johnson Space Center in Houston for four years. 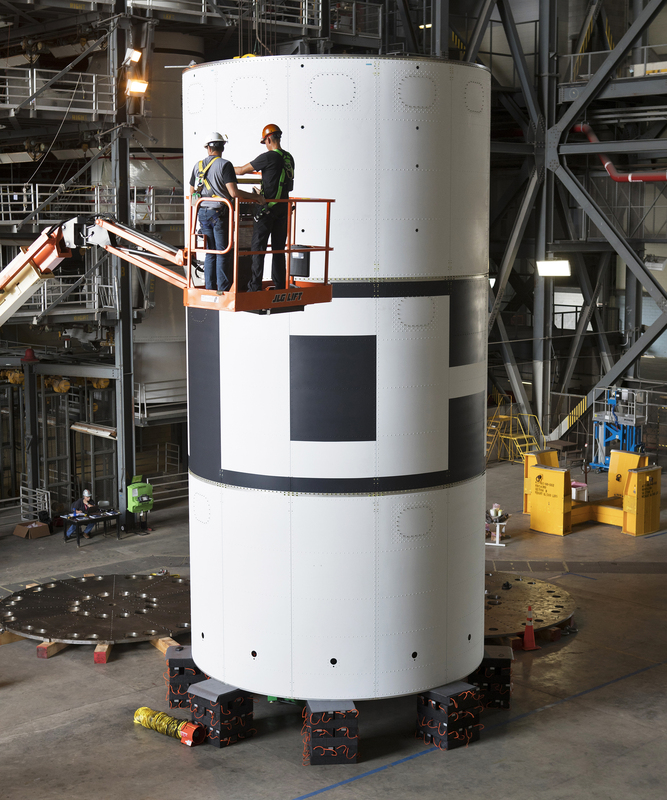 Work continues to prepare NASA’s Orion crew module for its first integrated flight atop the Space Launch System rocket. 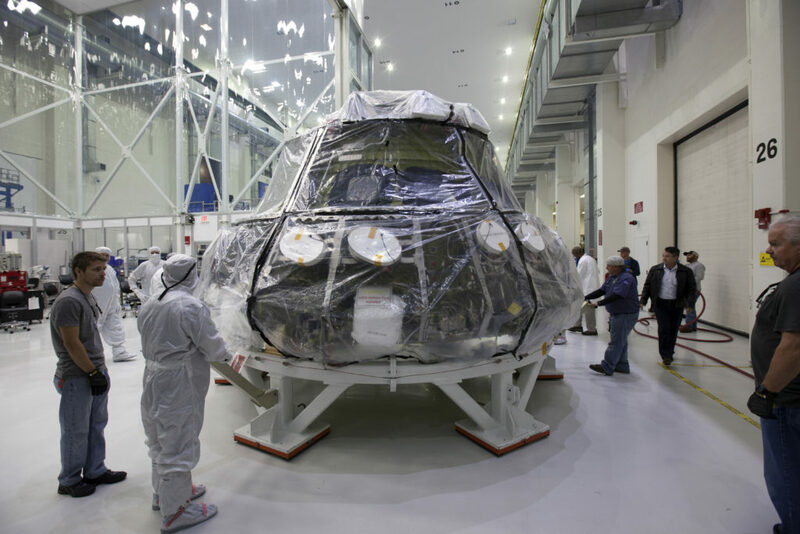 The crew module was moved from a clean room to a work station inside the Neil Armstrong Operations and Checkout Building high bay at the agency’s Kennedy Space Center in Florida to prepare for the next additions to the spacecraft. In the clean room, engineers and technicians completed the welding of the tanks to the propulsion and environmental control/life support systems (ECLSS) tubing. They also completed welding to install the propellant, pressurant and post-landing coolant tanks. The pressurant is used to maintain the flow of propellant and coolant in the propulsion and ECLSS systems, respectively. 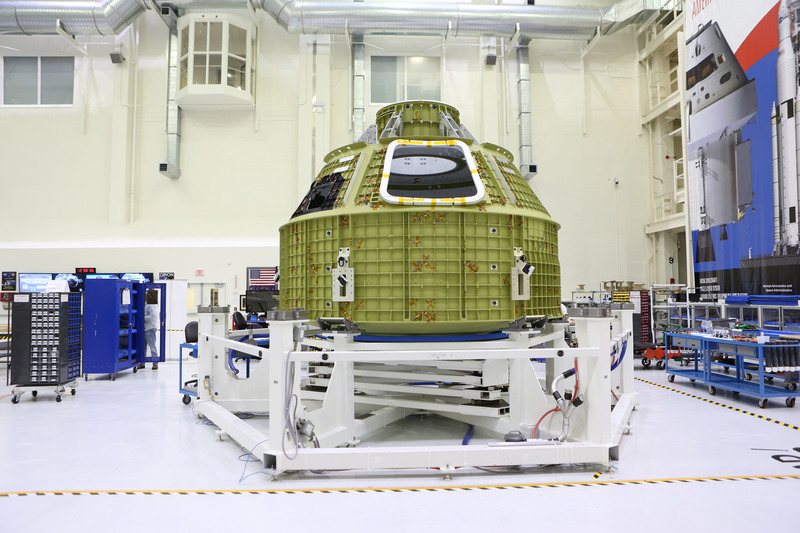 Now secured in a work station, Orion will undergo additional processing to prepare it for launch in 2019. The crew module up-righting system, comprised of five up-righting bag assemblies, each with an inflation gas assembly, will be installed in the crew module’s forward bay. The up-righting bags are inflated after the crew module splashes down in the ocean and will turn the spacecraft upright if external forces cause it to roll over. The three main parachute assemblies also will be installed in the forward bay. Orion’s crew module will be populated with avionics components, including control systems and communication and data units. Flight wire harnesses, which distribute power and data among the spacecraft’s systems, will be routed throughout the crew module’s forward bay, crew cabin and aft- and mid-bays. The first flight of SLS and Orion will send the spacecraft beyond the moon before Orion returns to Earth and splashes down in the Pacific Ocean. The mission will demonstrate the integrated performance of the SLS rocket, Orion and ground support teams before a flight with crew in the early 2020s. The Orion crew module that traveled into space beyond low-Earth orbit on Exploration Fight Test 1 (EFT-1) completed a different kind of trip this week at NASA’s Kennedy Space Center in Florida. 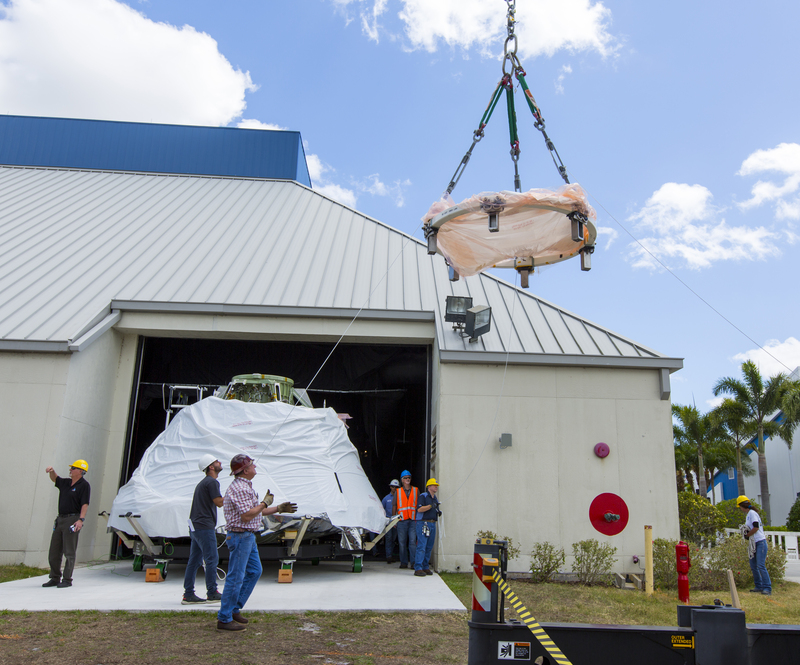 Secured on a custom-made ground support equipment transporter, Orion was moved from the Neil Armstrong Operations and Checkout Building high bay to the Kennedy Space Center Visitor Complex, less than three miles down the road. The crew module will become part of the NASA Now exhibit inside the IMAX Theater at the visitor complex. The Orion spacecraft launched atop a United Launch Alliance Delta IV rocket Dec. 5, 2014, from Space Launch Complex 37 at Cape Canaveral Air Force Station in Florida. The spacecraft built for humans traveled 3,604 miles above Earth, and is the first U.S. spacecraft to go beyond low-Earth orbit in 42 years. The Orion crew module splashed down approximately 4.5 hours later in the Pacific Ocean, 600 miles off the shore of California.